Sen. Mary Landrieu, right, and Rep. Bill Cassidy greet each other Monday in Baton Rouge, Louisiana, before the start of their final debate before the state’s U.S. Senate runoff on Saturday. 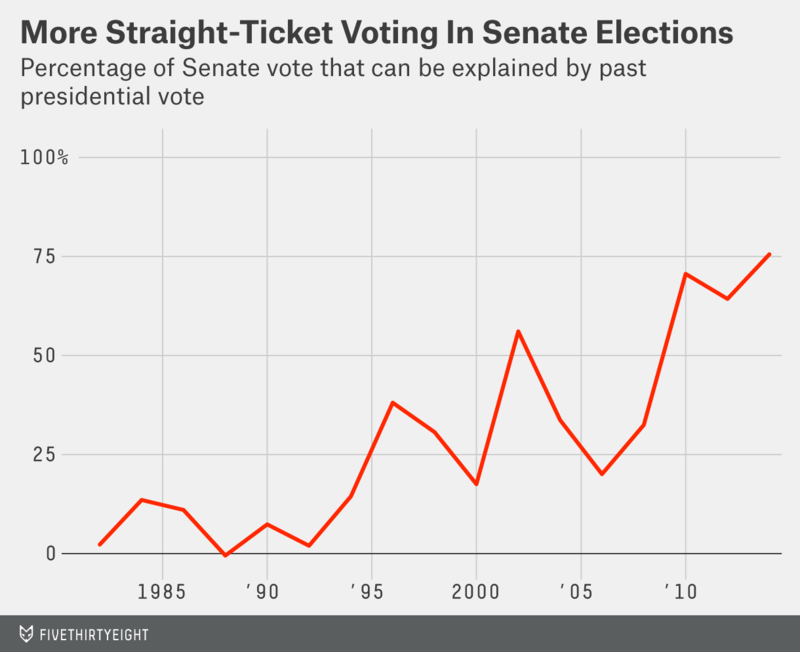 The 2014 Senate elections continued the two-decade-long rise of straight-ticket voting, when voters choose the same party for every race. Two decades ago, knowing which party won the most recent presidential race in a state told you almost nothing about who that state’s U.S. senators were. Candidates and campaigns mattered a lot. The Senate was crowded with Democrats from red states and Republicans from blue states. Now, individual personalities mean less; party means more. The party that won a state in the most recent presidential election is likely to win — or have just won — that state’s Senate seat. This, of course, is bad news for Democratic Sen. Mary Landrieu, who is expected to lose a runoff in Louisiana on Saturday. Assuming Landrieu loses, the seat would fall in line with its presidential preferences, and only 20 percent of the Democratic caucus in the next Senate will be from states that are more Republican than the nation as a whole (we defined the political lean of each state using a weighted version of the Cook Political Report’s partisan voter index, a measure of a state’s presidential preferences). In 1983 and 1995, Democrats controlled 46 seats (the number they are likely to have in the next Senate), but in both years 41 percent of their seats came from red states. In 2014, past presidential election results explained 76 percent of the Senate results. That’s the highest percentage in the past three decades. Prior to 2010, 2002 was the only year in which the predictive power of past presidential results was over 40 percent. In other words, voters who favor Republican presidential candidates are now very likely to favor Republican Senate candidates. U.S. House and gubernatorial elections can be increasingly predicted by past presidential voting as well. The latter is especially interesting considering that governors are state, not federal, politicians. The question going forward is whether the link between presidential and Senate results will increase, decrease or stay the same. If the straight-ticket effect doesn’t weaken, it could be bad news for Democrats, assuming we’re a 50-50 nation over the long haul. By our presidential vote metric, 54 Senate seats are in states that are more Republican-leaning than the nation on the presidential level, and 46 are in states that are more Democratic-leaning.